Hello! Hope you are well. My sister and her family moved into a (new to them) house back in September and she had asked me to fly out and help her get organized, so last month I was finally able to do that. The first thing I want to show you is her laundry room. 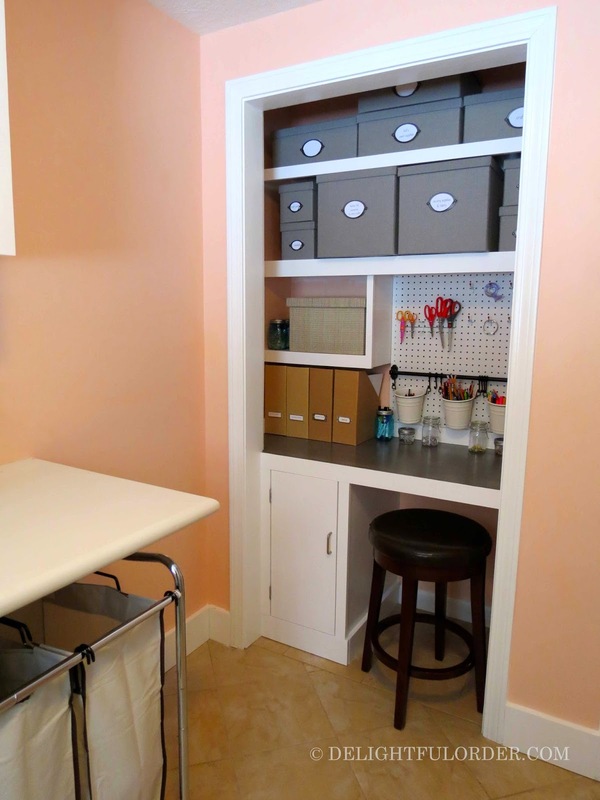 It had to serve as a laundry room, but it also had to serve as a craft area and an office, all in that one space. So (over the phone and via emails, etc.) my sister and I came up with a plan and our brother built some shelving and a new desk too. My sister went and did her shopping (with a list that I helped her come up with) before I arrived. As soon as I got there, we went to work organizing! 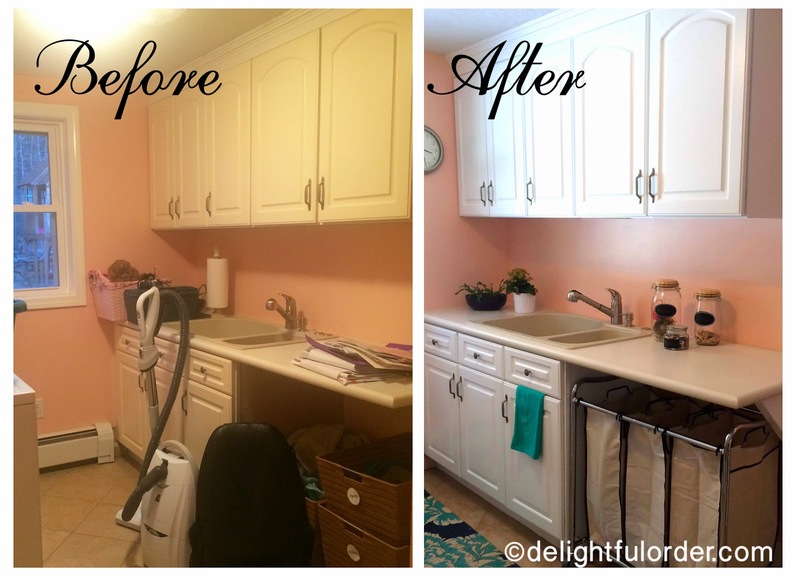 and here are the before and after side by side photo's of this side of the laundry room. NOW moving onto the craft/ office section. 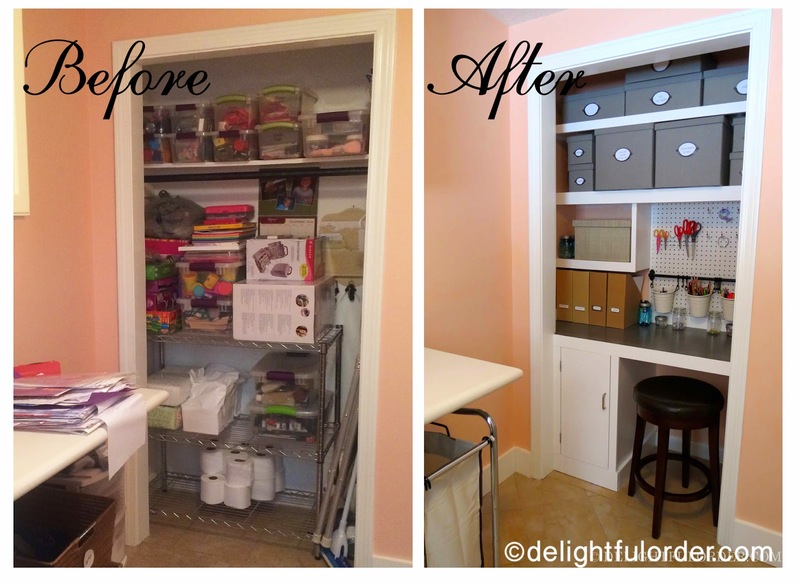 We created a craft/office closet all together. I LOVE transformations like this and I LOVE the challenge of creating them too. Come back soon! I'll show you more of the organization we did in just a few short days. 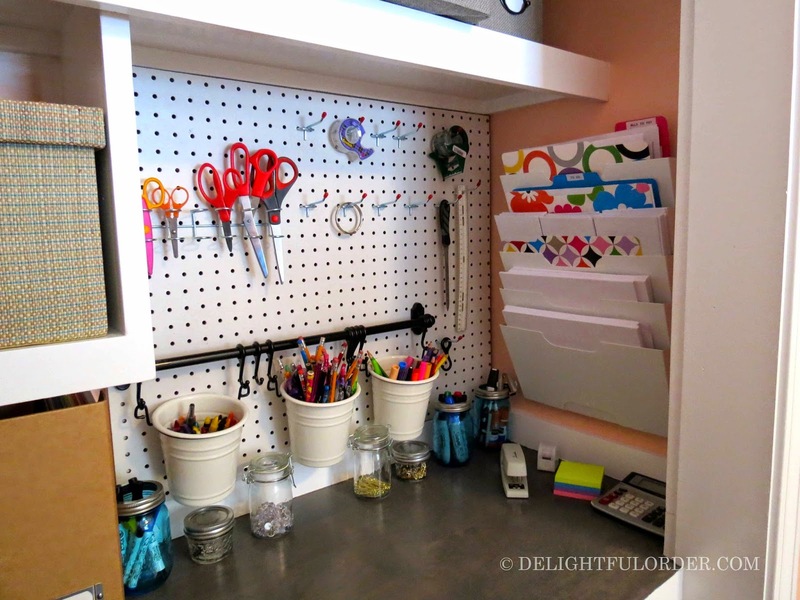 I absolutely love the closet craft/office area!!! 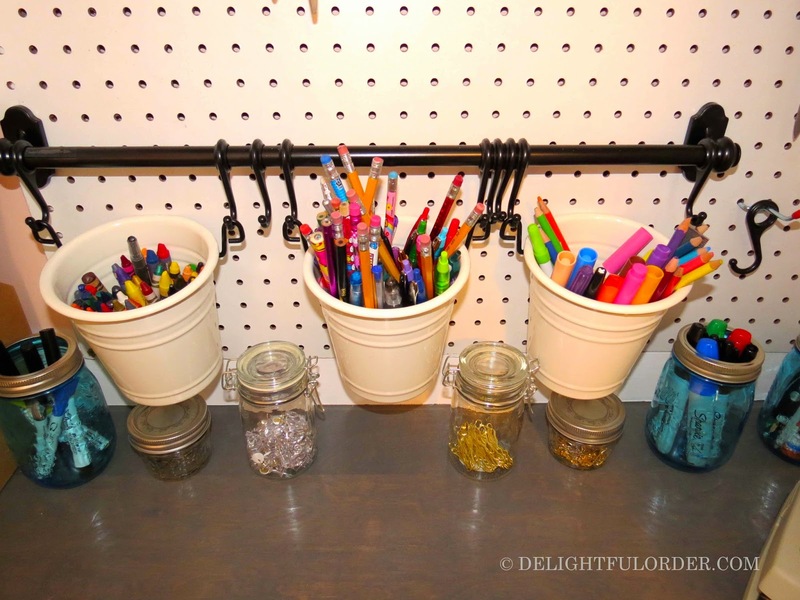 Although I have yet to figure out how I would fit all my craft stuff into a closet area but I would love to have one!! We have the perfect space for this but my only dilemma is where to put the cat litter. I just cannot imagine myself being creative with the smell!, lol! Where are the beautiful baskets & shelves from??? The white laundry baskets are from Target. 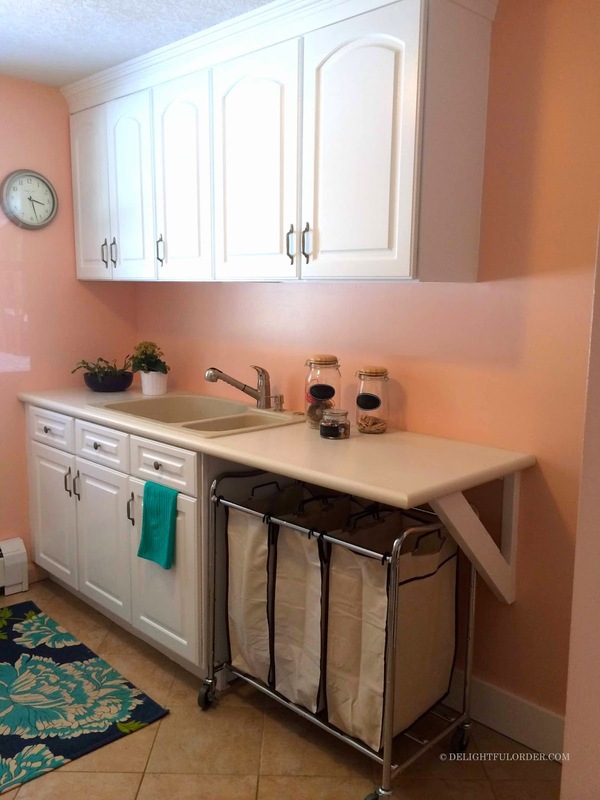 The gray baskets are from Ikea and the shelving was custom built. 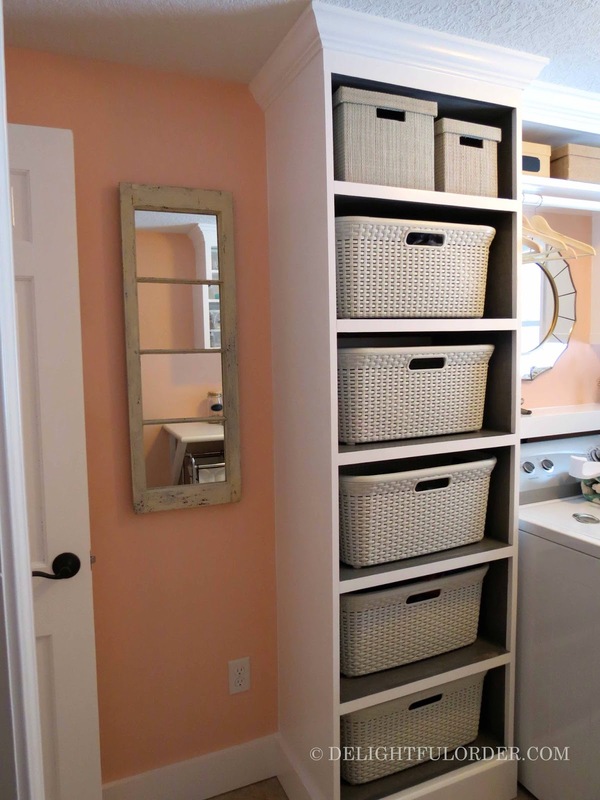 I really like the grey baskets.....they are cute and look sturdy. Nice job! 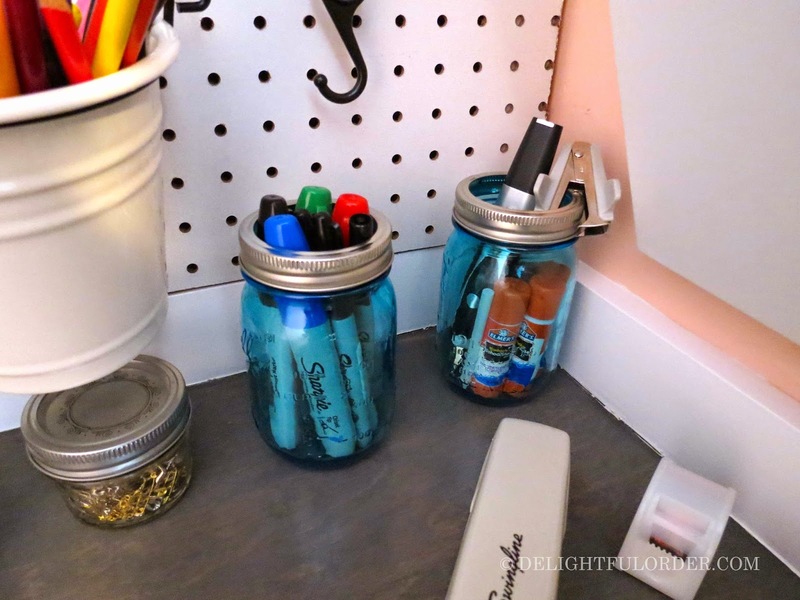 I bet she's SO excited to have a new and organized space! Wow - looks amazing. You really got to work. I'm sure she just loves it and that it functions so much better now too. Great transformation. Wow, looks beautiful! 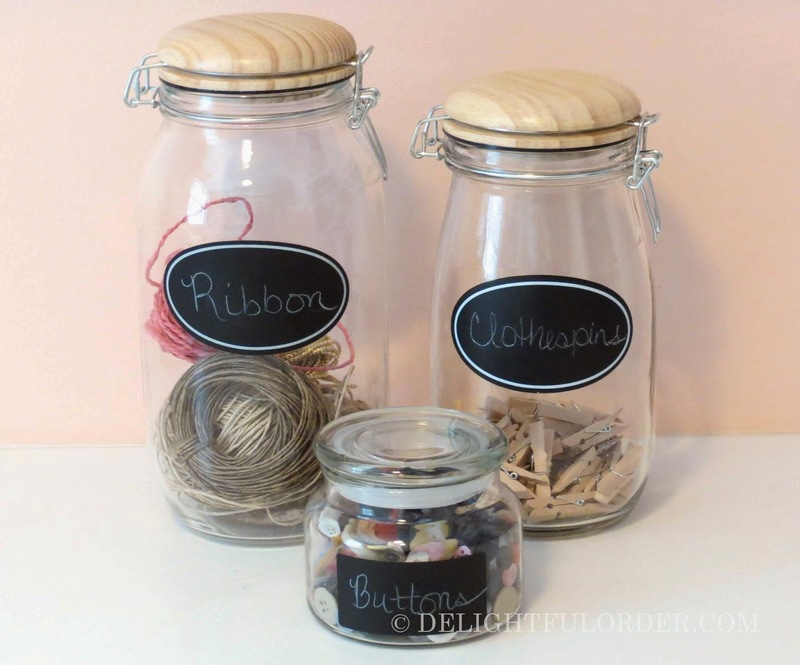 Where did you get the oval labels on the boxes in the craft area? They are so pretty! Beautiful pics here. 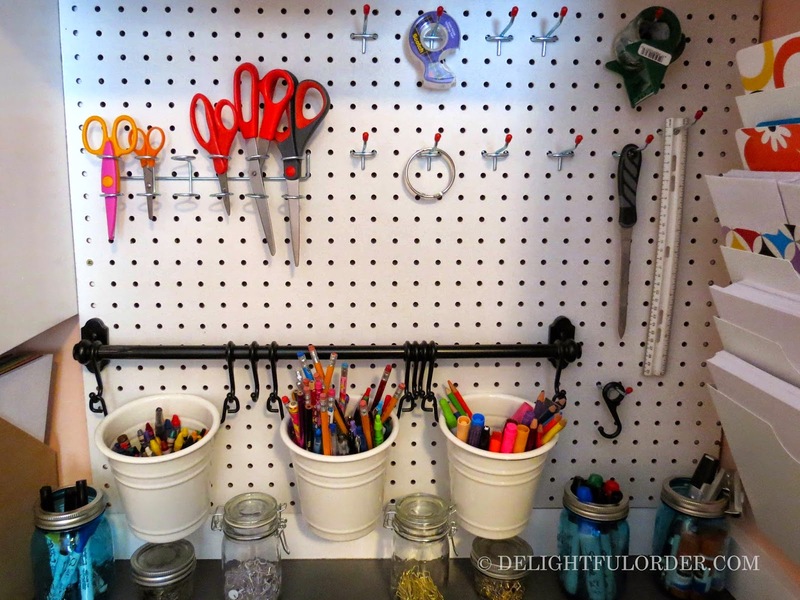 I've been meaning to put a pegboard up in my craft room, my only hesitation was that it might look "ugly" but you have incorporated yours so well! Thanks for the inspiration!! Looks great! 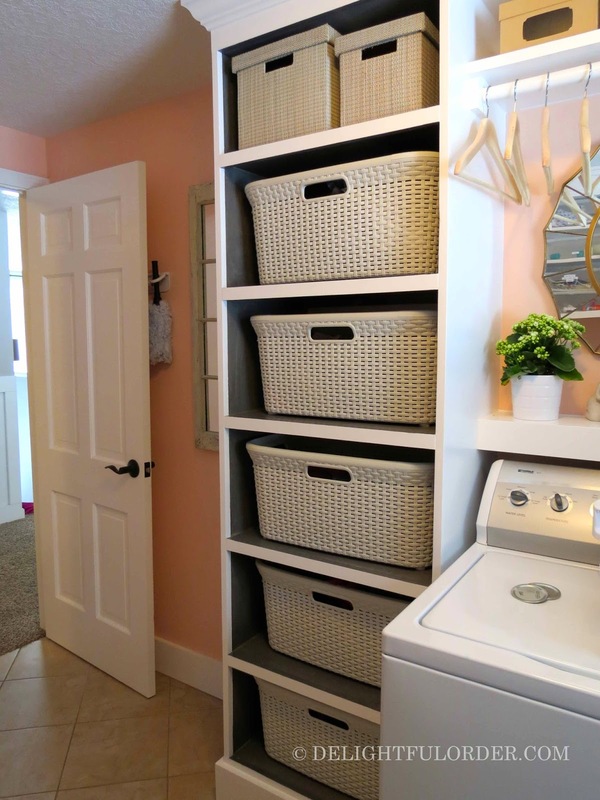 I love the different bins used for organization and storage in the laundry room. 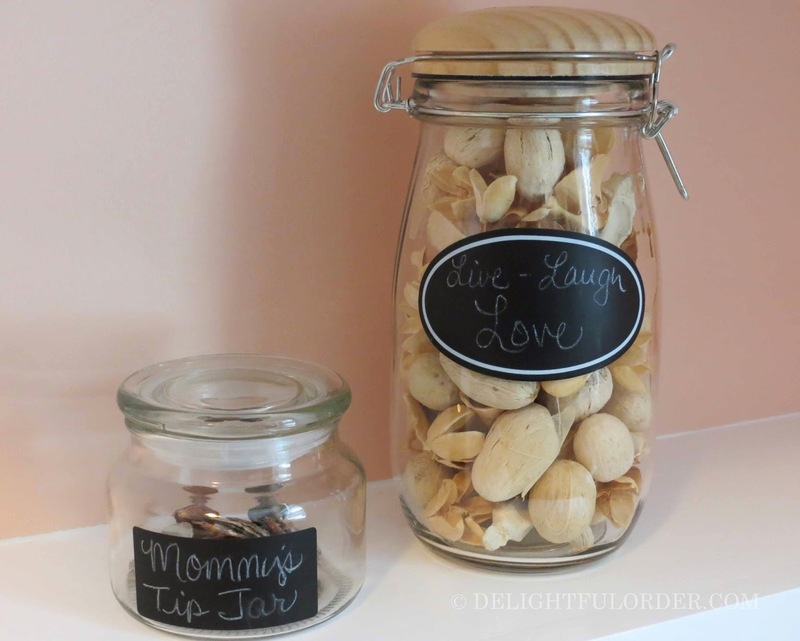 The tip jar is a very cute idea as well. Thanks for sharing! 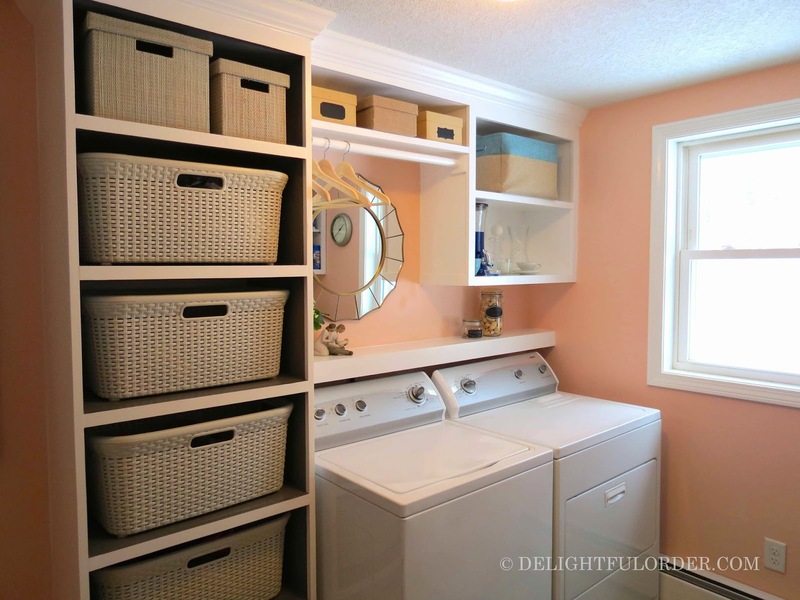 That shelving with the laundry baskets is exactly what I am looking to do in my new laundry room. 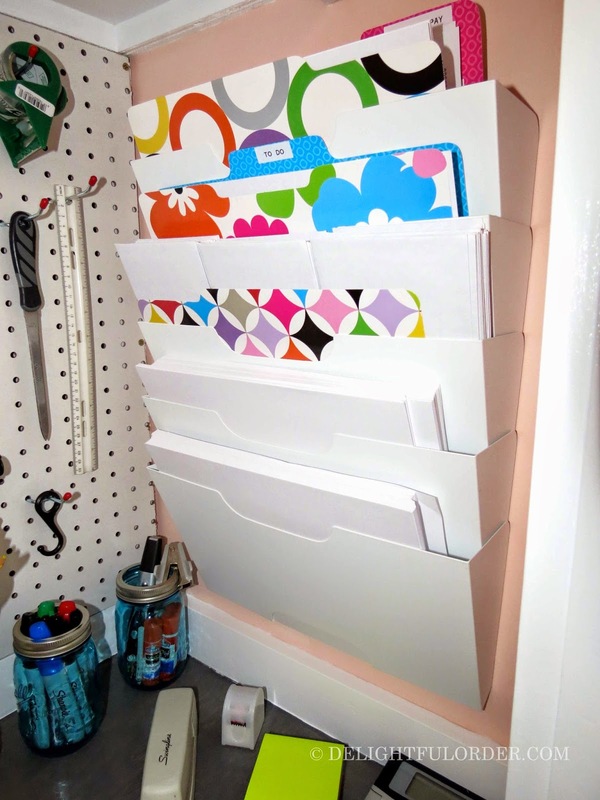 Above it said that they were from IKEA but I just searched the entire site and I don't see them--link please? The shelving was custom built. It is not from IKEA. The gray baskets are from Ikea. Where did the hanging buckets come from? What are they called? Love the whole room! !